She's gonna inspire many a wedding Pinterest board. 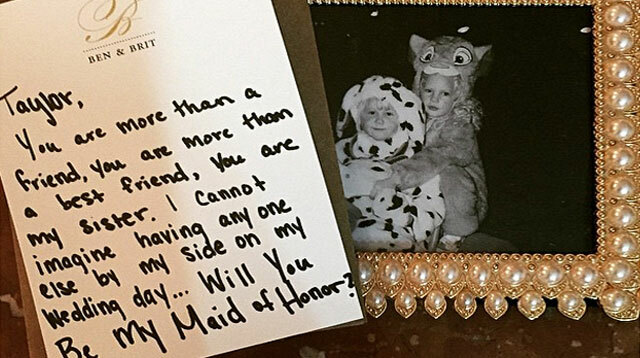 Brit Maack, Taylor Swift's other best friend (you know, besides Lena Dunham, Karlie Kloss, and you), recently asked Taylor to be her Maid of Honor, and Taylor responded in the most adorably Taylor way, via Instagram. This girl knows how to pull our heartstrings via social media. This is gonna be the best wedding ever, because you know Taylor is gonna hop up on that stage and write Brit an impromptu wedding song that'll later become a platinum hit in 46 languages. Ah, the perks of being bff with that flaxen-headed superstar crooner witchy woman. Um, how does one go about getting a ticket to this wedding?